Are you thinking about installing a skylight? 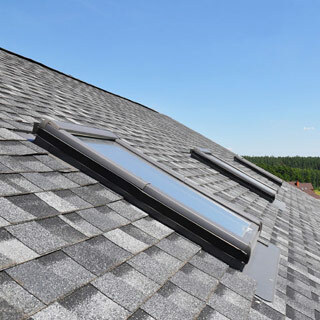 That’s great news because a skylight has become one of the most popular home renovations and may increase your home’s property value. A skylight lets in up to 30% more natural light compared to a traditional window in the wall. Installing a skylight is relatively inexpensive, but can become a complicated home renovation DIY project. When you install a skylight, you’ll make your home’s interior look brighter and larger, which your whole family is sure to enjoy. Here, our skylight experts explain how to install a skylight. Use a stud finder and be sure that you choose a place to install your skylight that’s in between framing studs. Drill a small hole in your interior roof’s drywall that you will use to determine the exact placement of your skylight. Use a light beam and shine it through the location hole you’ve just drilled. Make sure the area above your ceiling is clear of ductwork, plumbing, and electrical. Otherwise, you will have to reroute all of that in your attic before installing your skylight. Drill a second location hole in your exterior roof. Use a level and make sure your holes in both your exterior roof and interior ceiling line up. Using a circular saw, cut a hole in your roof. Remove all shingles, tar paper and roofing nails around the immediate area. Before you drop your skylight into the roof’s hole, add a layer of tar paper at least 12 inches wide around the hole. Follow the manufacturer’s instructions for the placement and installation of your skylight. You will want to add the flashing from your kit or use the step and continuous flashing listed above. If your skylight kit comes with a sufficient amount of flashing, then that’s all you need. It may be necessary that you use more flashing. The step flashing is the L-shaped flashing and continuous flashing is in a strip. In many areas, building codes no longer require you to use L-flashing. Some places only require you to use continuous flashing. However, we recommend that you use the L-flashing in addition to continuous flashing. You’ll have better water resistance and better endurance using both. After you have added the tar paper and flashing around the perimeter of your skylight, the only thing left to do on the exterior roof is to add shingles around your skylight. Be sure to use a sealant or caulk on any area that’s not completely covered with shingles, such as along the skylight seams. Inside your home, you will need to add a frame using the 2 x4’s around your skylight. It’s important that you frame your skylight because this will ensure your roof is structurally sound. Add new drywall and paint. Installing a skylight can be a challenging home remodeling project for a DIYer because it involves cutting into your roof. Your roofing, framing, insulation, and flashing have to be done correctly. If you’re considering hiring a professional for the project, consider PJ Fitzpatrick. With almost 40 years of experience, PJ Fitzpatrick has the home repair and renovation experts you’re looking for. If you have any questions about how to install a skylight, our home renovation professionals are here to help. Request an estimate today and we can discuss the details of your project.